Prior to setting up Ryanair, Tony Ryan created Guinness Peat Aviation Ltd (GPA) in Shannon, Ireland. GPA became the largest aircraft leasing corporation in the world, with hundreds of airliners on lease to airlines all over the world. Its ordinary shares rose from $1 to $650 at the height. Then it collapsed, billions of dollars in debt, with hundreds of new aircraft on order. The book tells the inside story of the collapse over the period, before, during and after, written contemporaneously, as a private diary by a senior executive who foresaw potential calamity. 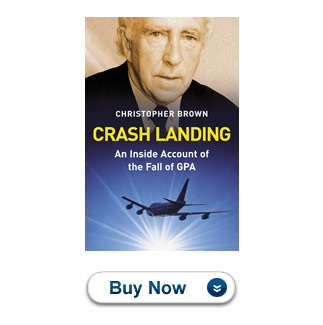 Christopher Brown started with GPA in 1985 as VP Marketing, in London. In 1986 he became MD of a GPA joint venture with Fokker/Mitsubishi, relocating to Shannon with his family, later returning to London, to commute to Shannon as VP GPA Group. After GE capital arrived in 1993, he stayed with GECAS until 1996. Thereafter he became an aviation consultant, working out of the UK and Guernsey. He now lives in the peak district with his wife Elaine.